Need advice about a specific Porsche 911 problem? Chart based on 33 repairs. 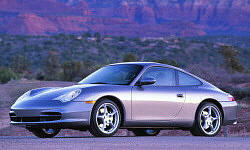 See TSBs and recalls for the 2004 Porsche 911. 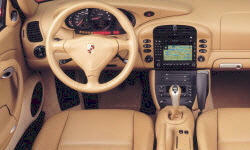 See repairs for all Porsche 911 model years. US $2190 Entire HVAC system failed. Had no A/C nor heat. Air flow fan speed also failed. C $600 Oil pressure sensor beginning to fail. Intermittent warning light. Replaced. US $115 Install new coffee cup holder and also perform Pre Purchase Inspection. US $1050 Replaced one catalytic converter. US $300 Replaced clutch accumulator. US $200 Replaced rear driver side brake light socket and wiring harness. US $240 Misfire and loss of power temporarily and engine light came on. One coil failed. Stopped and restarted the car and was able to drive normally but engine light stayed on. US $1200 Left rear window went down and would not come back up and then a grinding noise. Replaced window motor, cable and associated parts. 45000 mi Hydraulics for roof leaking and roof would not open or close properly. Cylinders reconditioned and replaced. US $6000 Unable to get into reverse. Clutch held once in gears 1-6 but trouble engaging. Hydraulic fluid missing. Slave master leak. Replaced Slave and clutch and once their also changed IMS bearing. Drove off away from garage and then water pump failure. US $450 Sway bar bushings are worn out. Bushings and linkages replaced. €673 RMS (rear main seal) was replaced. Clutch replacement (1st one). Total repair cost was relatively low because transmission was already out of the car due to RMS replacement. See our lemon odds and nada odds page to see vehicles with no repairs or vehicles with more than three repairs. To see how frequently 2004 Porsche 911 problems occur, check out our car reliability stats.